Masses of white blossom and burgundy autumn colour make this shrub a must-have! Another new introduction and a breeding breakthrough, Deutzia × rosea Yuki Snowflake erupts in spring with a profusion of snow-white flowers, looking just like pale cherry blossom. After its glorious show of flowers, Deutzia's colour peaks in the autumn as the leaves turn a vibrant shade of copper-burgundy before they fall, once again filling the garden with vibrant shades. 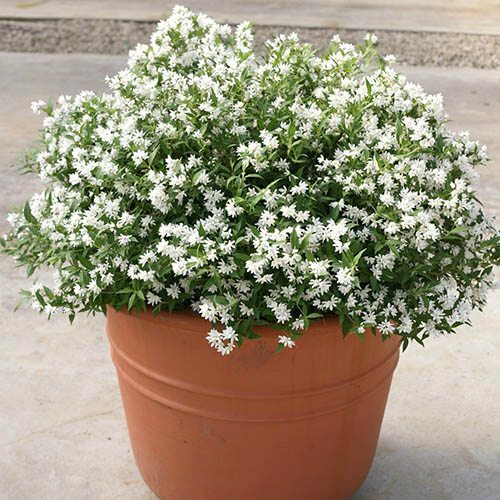 With its neat, compact growth, this little Deutzia looks fabulous in a patio pot on your balcony or terrace or when positioned at the front of a flower border. Easy to grow in both sun and light shade, Deutzia Yuki Snowflake is not normally offered for sale and this is your opportunity to be one of the first to grow such an eye-catching plant. A breakthrough in plant breeding, Deutzia × rosea Yuki Snowflake is a spectacular shrub, rightly prized both for its abundance of flowers and its extended seasonal interest. Tried and tested for garden performance, you can be sure that it will grow as expected. A spectacular show of white flowers smothers this compact Deutzia throughout the spring, almost obscuring its leaves with a voluminous display of white. Very easy to grow, and ideal in a container on your balcony or terrace, 'Yuki Snowflake'(R) will flower its heart out for you in sun or partial shade. You get even more value for money when Yuki Cherry Blossom continues with its display of colour into the autumn, turning a vibrant shade of copper-burgundy before dropping its cloak of leaves to reveal a sculptural framework of arching stems - a real plant of all year-round interest. Deutzia Yuki Snowflake will produce the most flowers when planted in full sun. Deutzia ‘Yuki Cherry Snowflake is easy to care for and fairly unfussy, preferring moist, well-drained soil. Grows in full sun to part shade. No regular pruning is necessary, as the flowers are produced on the previous year's growth, but you can encourage a bushy habit and help maintain an even shape by tip-pruning immediately after flowering. Any long leaders or lateral shoots can be pruned by a third at the same time.